Bebe carries many of the most popular styles of today's fashion world. From professional dresses, to trendy tops and bottoms, it's easy to find great looking clothes at Bebe! Bebe regularly offers promotions and sales on their chic contemporary fashion, many of which can be found here at Coupon Cause. Yes. bebe accepts PayPal as a valid form of online payment as well as all major credit cards. Yes. bebe accepts returns within 21 days of original purchase, tags must be attached. For more information on the bebe return policy, click here. Does bebe have a customer service phone number? Yes. Call bebe customer service at 877-232-3777, Monday-Friday 6am-8pm PT and Saturday-Sunday 7am-5pm PT. Does bebe have a rewards program? Yes. clubbebe is the bebe rewards program which gives members rewards for every 250 points, birthdays, and more! 1 point=$1 spent. Does bebe have any physical locations? Yes. bebe has physical locations but they are all outside of the United States. To find a bebe location, use the international bebe store locator. Does bebe sell gift cards? Yes. bebe sells gift cards which can be delivered in a signature presentation box. 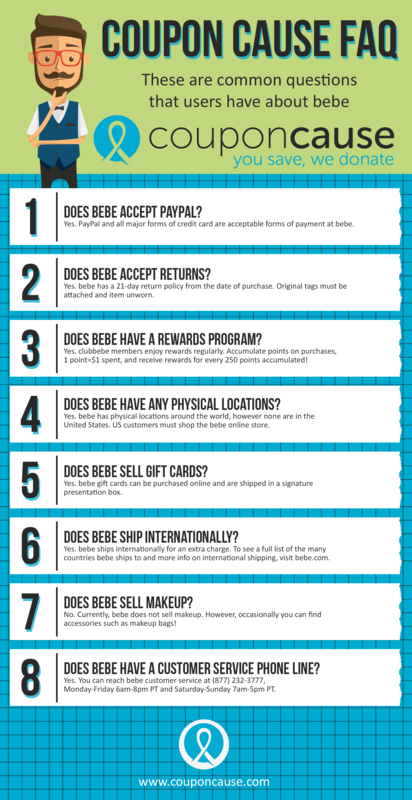 Buy a bebe gift card or check your balance here. Yes. bebe ships internationally for an additional charge. Check bebe shipping policy for more information. No. bebe does not sell makeup but you can occasionally find accessories like makeup bags. Are you happy with the bebe offers on this page?